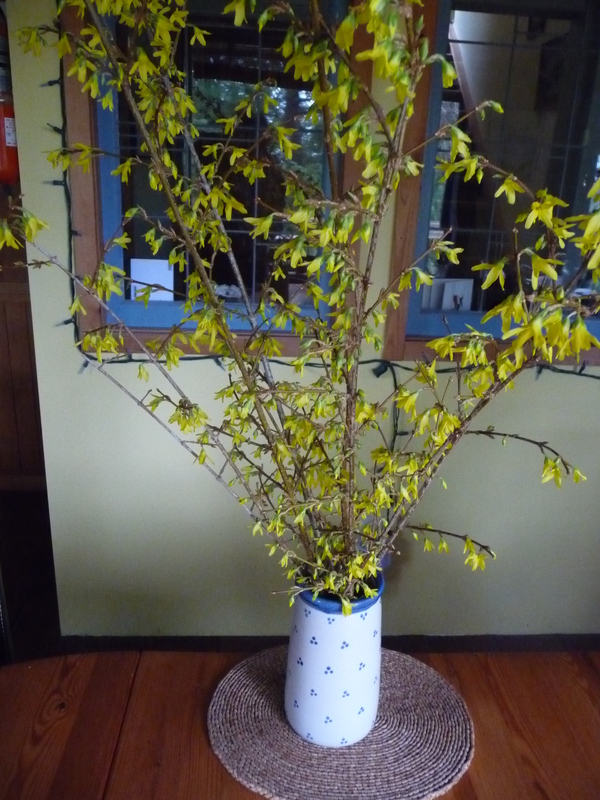 I came in from work on the fence we are putting around the vegetable garden, the area itself a sea of mud, of rocks, of bare poles waiting for the black mesh that keeps deer from our vegetables, and saw the jug of forsythia on the table. No, it’s not blooming outside yet but ten days ago I cut some branches, put them in a bucket in the utility room sink, and forgot about them until the other day when I brought them to the kitchen, knowing the warmth would force the flowers. And how like unexpected sunlight, like early spring, like a small charm against the grey rain. ~ by theresakishkan on February 3, 2013. This entry was posted on February 3, 2013 at 10:06 pm and is filed under Uncategorized.You can follow any responses to this entry through the RSS 2.0 feed.You can leave a response, or trackback from your own site.